How exactly do you go about handing someone their arse? Because that’s what David Moyes’s Everton did to Paul Lambert’s Aston Villa at Villa Park. Would it be something that happens just before kick off? Moyes knocks tentatively on the home side’s dressing room before entering, followed by Steve Round carrying a covered silver serving platter? On that cue, Roundy – not sure whether he actually calls him that; it’s a sort of best guess, but just run with it for the sake of the story – whips the lid off to reveal Everton’s surprise gift. 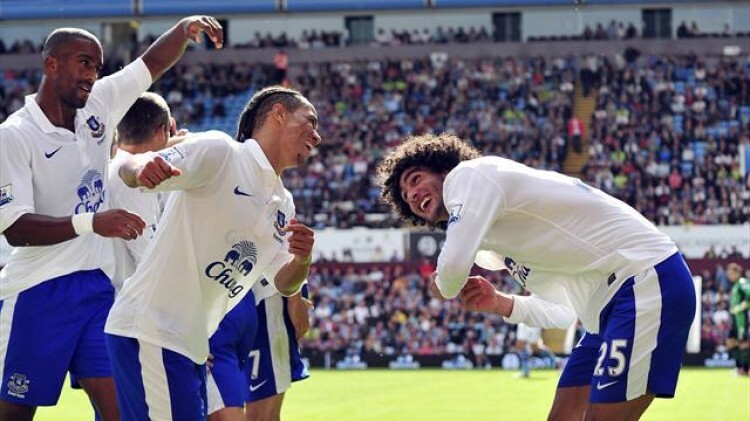 Luckily Steven Pienaar scored then. It was only three minutes into one of the most marvellous performances of the whole David Moyes era at Everton when the little midfielder ended one of countless training ground passing routines by rolling Steven Naismith’s ball forward with his studs before looking up and picking his spot, up and over Shay Given in the far corner of the goal. From that point on it was just relentless Everton brilliance. They looked like a serious, scary football team. Like when the great Manchester United sides have come to Goodison and controlled everything. For some reason Benfica spring to mind as well – when we played them at home the other year and they had everything: pace, power, organisation and bags of skill on the ball. The win over United on Monday was clearly epic – in the true-ish meaning of the word, not the way young people describe a mildly amusing night out – but almost all Premier League sides are capable of pulling out a big performance against the top sides from time to time. This was far more impressive. Fellaini was great again and he capped his performance with the second goal on half an hour. Everton’s total football was exemplified by Phil Jagielka’s freedom to burst down the right wing and send a superb cross over to the edge of the Villa six-yard box. Fellaini got Gnasher onto the ball, sending it into the turf where Given should have gathered comfortably. Fellaini is ostensibly playing in what was Tim Cahill’s position, but he operates in a different way to the Australian. He might not pose as much of a goal threat as Cahill in his pomp, but perversely pushing him forward seems to have added something to the team defensively. Sitting deep and facing opponents head on, Fellaini was often wrong-footed a little too easily. Now though, he constantly ambushes them from behind and side-on, pushing his hip into them and levering them off the ball judo-style. It’s really effective, disrupting moves before they even get started and allowing his teammates to break quickly and, in this encounter, with devastating precision. The third goal, on the brink of half-time, highlighted just what Everton were all about. Leighton Baines, who crucified Villa down the left, got to the bye-line and cut the ball back to Nikica Jelavic whose instinctive running had already left the defence marking fresh air. 10 yards out. One touch with his left foot. Bang. There was more of the same in the second half, and the chances are too numerous to recount. Distin had one headed onto the bar, Baines should have had a penalty and Given made a good stop from Pienaar’s flick up and volley. Villa’s side just seems packed with tattooed young chaps with Tom of Finland haircuts, and one of them, Ciaran Clark, was dismissed early in the second period for a professional foul on Jelavic. The Croatian accepted a great through-ball from the impressive Darron Gibson and cut across the young defender in a manner that almost demanded that he bring him down. They always seem a bit minty those decisions, especially when it’s only a little touch needed to send the forward tumbling, but at 0-0 you would be screaming for the red card. If anything it was just too easy for Everton then. The introduction of Seamus Coleman and a first appearance for Kevin Mirallas livened things up a bit, and the debutant came close to scoring twice thanks to crosses from the Irishman. The first centre was cut out by Ron Vlaar’s frantic lunge, with Mirallas poised to burst the net. The second was dispatched with a diving header, only for a linesman’s flag to cut the celebrations short. Villa gave the scoreline a veneer of respectability that it really didn’t deserve when Karim El Ahmadi’s swerving shot from distance deceived Tim Howard for the game’s second goalkeeping howler. Things almost got really stupid when the home side’s only decent passing move finished with Andreas Weimann’s shot striking Howard’s post and Darren Bent hitting Baines with the rebound. It ended 3-1 then, but just like the last time we won at Villa Park, the scoreline really doesn’t reflect just how brilliant Everton were. Posted on August 26, 2012 September 18, 2012 by mob1971	This entry was posted in Match Report and tagged Aston Villa, Everton, Fellaini, Football, Jelavic, Leighton Baines, Moyes, Paul Lambert, Steven Pienaar. Bookmark the permalink.